Truth be told, it is near to impossible to cover everything that happened at Anime Festival Asia Singapore 2014. There are far too many things happening at once, which completely highlights the need to sit down and plan what to do, where to be, before stepping into the convention hall. Speaking of music, this year’s Anime Festival Asia also featured the upcoming Death Note the Musical, inviting along Hayato Kakizawa, the handsome actor who will star as Light Yagami in the musical next April. The figure of the death god, Ryuk, that was used in the production of the live action movie, was also brought it for fans of Death Note to take photos with. If I had to choose two of my favourite places to be at AFA this year, it will be the Canon photo booths and the niconico kunikaigi area. I honestly think the photo booths sponsored by Canon this year was a brilliant idea, both as a con-goer and as a cosplayer. There was a variety of backdrops available, from a classroom scene that would work for most slice-of-life anime series, to a sunset view of the Merlion and Marina Bay Sands. For non-cosplayers, wigs are also available for loan if you want to dress up and join in the fun too! A good area of the festival grounds was dedicated to Niconico’s off-line event, niconico KUNIKAIGI (Japanese Internal Culture Festival). Visitors will be able to experience iconic scenes from top anime titles, including Attack on Titan Hands-on Trainee Soldier Try-outs, and Sword Art Online Nerve Gear Try-ons. There was also a solo karaoke booth set up for you (and your friends, depending on how many you can squeeze into the booth) to belt out your favourite anime songs and have it streamed onto the Internet in real time. It seems that we here in Singapore are just bursting with musical talents, if the comments from the users watching the stream on niconico douga were anything to go by. On a completely unrelated note, seeing an anime-fied version of Manchester United at the Nissin cup noodles booth totally made my day too. One good thing about the event this year is that unlike last year, most of the booths are placed further apart, which allows for easier movement of the human traffic. It also made it easier and more encouraging for visitors to stop by the booths to check out what they have instead of just squeezing past and move with the rest of the tide. The only exception would be the artist booth over at Creators Hub, where shopping is still made very difficult by the limited space available to even walk. 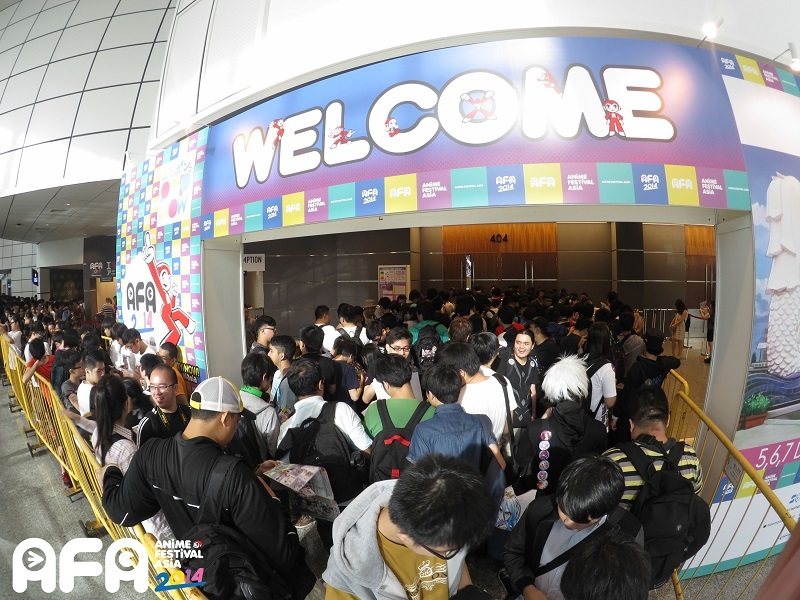 All in all, Anime Festival Asia Singapore 2014 was awesome, and while I am nursing a sore throat and loss of voice after a weekend of screaming, cheering, and fangirling, I am also already making plans for Anime Festival Asia Thailand 2015. 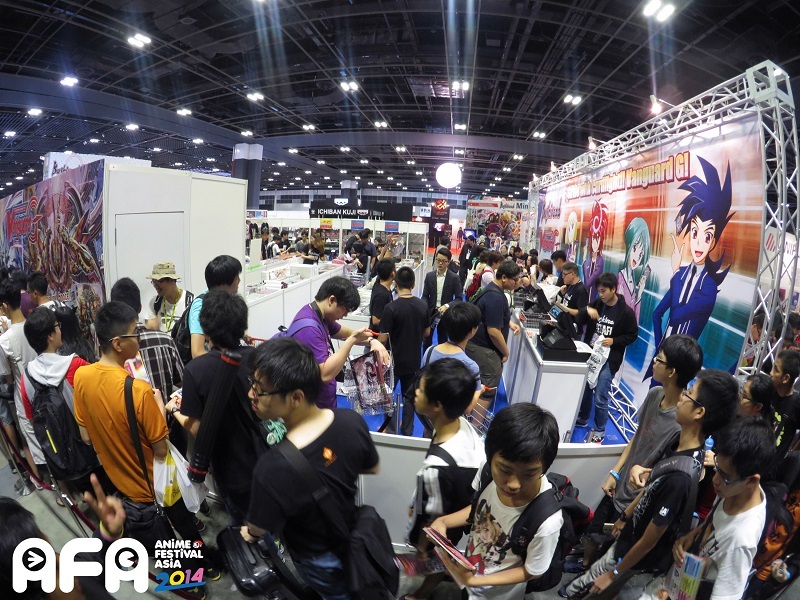 The event will be held in conjunction with Bangkok Comic Con at Bangkok International Trade and Exhibition Centre (BITEC) on 1 – 3 May 2015. See you there!